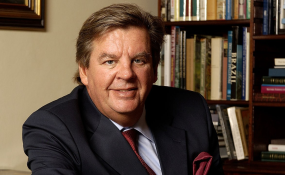 One of South Africa's richest businessmen Johann Rupert was accused of being arrogant, racist and suffering from cognitive dissonance on Tuesday evening during an event hosted by PowerFM. The multi-billionaire was a guest on an annual event hosted by the radio station's founder Given Mkhari called Chairman's Conversation. Rupert, who is chair of the Swiss-based luxury-goods company Richemont as well as of the South Africa-based company Remgro faced tough questions from the Johannesburg crowd following a two-hour long one-on-one conversation with Mkhari where he touched on various topics including corruption, land expropriation, investor confidence and building a sustainable business as well as the Afrikaner Broederbond. He also touched on the fact that unlike in other countries, the SA Revenue Services did not treat big business leaders like himself with the appreciation that they received from their counterparts overseas, which didn't sit well with him as a loyal South African. "Do you know the difference?" he said pointing out that a Swiss ambassador was in the attendance. "In Switzerland I got a letter of 'Thank You' from the taxman... but here they harassed me for eight years. So unlike what your friend with the red beret thinks [seemingly referring to EFF leader Julius Malema]... who said five years ago that I am 'influential' in SARS, no, no - the opposite." "They didn't go and buy BMWs and hang around at Taboo or The Sands all the time." Speaking of his Afrikaner heritage, Rupert said he was proud of it but said based on their history in the country, they too had been an oppressed nation and still felt "endangered" as a people to this say. "When I met the late Steve Biko, after many hours of discussions, we came to the conclusion that we will never have piece in this country if Afrikaner nationalism and Black nationalism cannot come to a compromise. That was in 73/74; we're sitting in 2018, we'd better find that compromise." "I don't think we'll ever have peace until there is a proper redistribution. I wouldn't say land, I would say property and that we grow the economy... It's not a question of doing it, it's how it's done... Let's not fall into the trap of Zimbabwe and Venezuela. Everything looks good on paper, but the game is played on grass." "President Mbeki wasn't scared... you need a proper dialogue, but for that, both parties need to trust the other side's bona fides." Rupert also denied being part of any white monopoly capital or the so-called "Stellenbosch Mafia" he was not aware of both. In response to a question by journalist and PowerFM presenter Iman Rapetti on being labelled as racist by some watching the interview and posting their views on Twitter, he said: "I've been accused of a lot of things... In the old days, when you were against apartheid you were called a communist, nowadays if you're against corruption... . How do you defend being called a racist? Luckily I've never been called that in public or in private and my friends know that it doesn't exist and I actually take exception to that." "I've said the big problem in this country... instead of people debating facts, they get personal, they attack individuals and attack their children and that's a Donald Trump-type style. I think all of us are adult enough to debate issues, but why get personal all the time. We carry on like this, the other side loses interest very quickly. "Our country's got very serious problems, best illustrated by the clear division tonight. There's clear hatred, there is clear animosity and insults; quite frankly, if that's the attitude I can tell you that we're going to have serious problems in this country... Quite frankly, I'm very happy not to get involved; I'm quite happy to spend time with friends and children and not to help... there are many other countries where you don't get insulted like this." "I've been luckier than I thought I would, I made more money than I thought I would and that I often think I deserve and my mother taught me to share, and I really give away a lot more money than I spend on our family. Quite frankly, I don't need lessons in sharing, because I know what I do and luckily the people close to me know what I do."